Six years after PM vowed to build 300 new homes to replace 30 demolished in Samaria town, Beit El to get 650 new housing units. After roughly a decade without new housing construction, the town of Beit El is about increase in size by as much as 65%, with the construction of a new neighborhood promised as compensation for the demolition of 30 housing units six years ago. Home to some 6,000 people and the Beit El Yeshiva network, Beit El is often referred to as the ‘flagship’ community of the settlement enterprise, and its growth – or lack thereof – has been seen by many within the movement as a barometer of the vitality of the effort to settle Judea and Samaria. Once a fast-growing town which drew young couples, Beit El’s growth has slowed to a crawl in recent years following a de facto building freeze. Over the past decade, not a single new housing unit has been approved in Beit El, and the number of homes has actually decreased. In 2012, in keeping with a Supreme Court order, the Netanyahu government demolished 30 homes in what was known as the Ulpana neighborhood of Beit El. As part of an agreement with Beit El leaders, Netanyahu vowed to build a new neighborhood in Beit El with 300 housing units, to be built on the old Border Police base within the town. Six years later, the Prime Minister’s promise still has not materialized, though by this July it appeared that the new homes would finally be marketed and built. 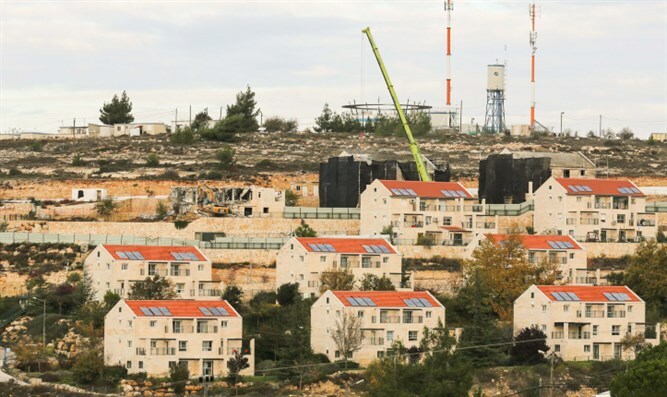 According to a report by Israel Hayom on Tuesday, however, the new neighborhood in Beit El will include not only the 300 housing units promised by Netanyahu in 2012, but approximately 650 new homes. When completed, the new neighborhood is expected to increase the population of Beit El, which currently includes just under 1,000 homes, by some 65%. The expanded housing project received approval from the Housing Ministry. “This is a real cause for celebration for the residents of Beit El and the entire settlement enterprise,” said Beit El mayor Shai Alon.